In his quest against ‘fake news’, Donald Trump has launched a Mainstream Media Accountability Survey asking Americans to “fight back against the media’s attacks and deceptions.” The unprecedented poll was met with much trolling online. In the wake of Trump’s press conference where he attacked much of the media for its alleged biased reporting and spreading of completely made up stories based on dubious sources, the US President said on Twitter that “fake media” is the enemy of American people. His campaign's fundraising committee sent out an invitation to Trump’s supporters to take part in the unconventional poll. With many leading questions, the survey appeared to set out to prove how right Trump’s administration has been. How long until we see the results of the mainstream media accountability survey? I'm sure the results will be a surprise. 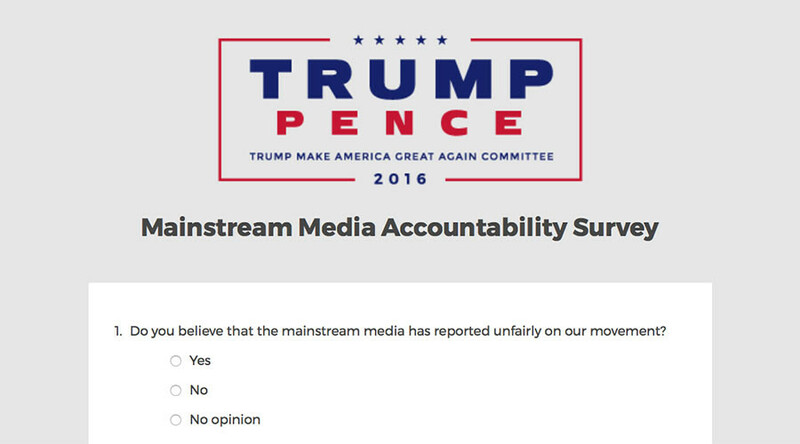 “Please take the Mainstream Media Accountability Survey to do your part to fight back against the media’s attacks and deceptions,” the email read. CNN, MSNBC, and Fox are named in the survey, with respondents asked which television source they get their news from and whether they trust the outlets to “report fairly.” The survey also asks respondents to list the news sources they use the most. Another question asks on which issues the mainstream media does “the worst job of representing Republicans.” Choices include immigration, economics, pro-life values, religion, individual liberty, conservatism, foreign policy and Second Amendment rights. “Do you believe that the media unfairly reported on President Trump’s executive order temporarily restricting people entering our country from nations compromised by radical Islamic terrorism?” and “Were you aware that a poll was released revealing that a majority of Americans actually supported President Trump's temporary restriction executive order?”, were among the more specific questions in the survey. Users were also asked if they believed that political correctness was the cause of the biased news coverage with regards to illegal immigration and radical Islamic terrorism. The bizarre survey received a lot of attention online, with many choosing to essentially troll the president by filling out the survey with their opinions and comments. Others appeared confused by the wording of the questions.